December's here and I am all about Christmas decorating! There's only so much we can do in our little Chicago hi-rise, so I am spending this whole month mooning over gorgeous homes dressed up for the season! First up is this charming and energetic family home in Austin, Texas, decorated to perfection by the lovely ladies of Tilton Fenwick - let's have a look! There's not going to be a "White Christmas" in Austin, but the front stoop of this home is joyfully covered in garlands, plum colored ribbons, and lanterns. The succulents add a nice Texas touch. The large living room is split up into two separate seating areas to make the space more livable. A gorgeous green velvet sofa provides the base for the palette of the room in blues and green that stand out against the crisp white walls. A towering Christmas tree is covering in glittering bulbs and ribbon, and a coordinating pile of presents is stacked below. A fragrant garland envelops the mantel and the elk antlers get a matching wreath too! 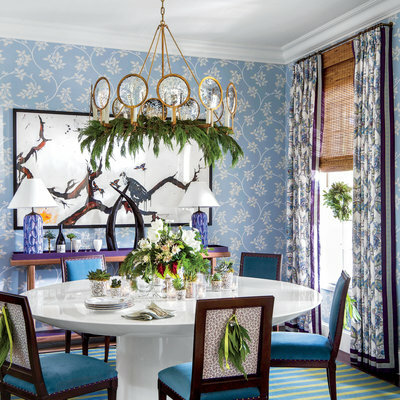 The welcoming dining room is alive with layers of pattern and color. I am obsessed with the masterful mixing of floral wallpaper, floral drapes, striped rug, and the petite leopard print gracing the backs of the dining chairs. Shades of blue and plum mixed with holiday green make the room both sumptuous and fresh. With a wife and two young daughters, the father of this family loves the more masculine vibe of the den, with its simple bamboo roman shades, tartan ottoman, and contemporary photography. The beautiful country style kitchen features a large trestle bottom table surrounded by woven bistro chairs on one side and a big upholstered (and laminated, for the oopsie-daisies of the two little girls who live here) banquette on the other, perfect for family meals, or coloring book afternoons. Elder daughter Teddie's room is a vibrant and happy space awash in lavender and spring green. The combination of gingham carpet, ticking striped beds, floral toile des nantes striped style wallpaper, and paisley roman shades give the room a ton of personality while remaining soft and not overwhelming. I adore the garlands and wreaths festooning the beds for Christmas. The fabulous master bedroom has a combo of two of my all time favorite design doyennes with its Sister Parish wallpaper and roman shades, and the Dorothy Draper black and gold chest (topped with a Bunny Williams lamp, so maybe its three design lady legends...). The glamorous bed is made with wonderfully scalloped Julia B linens and topped with a faux fur throw, perfect for chilly December nights. That hint of a curvy rattan chair off to the lower right is killing me! The colorful and cheery Christmas decorations do an awesome job meshing with the welcoming vibe of this family home, and not fighting it. Not a traditional red dominated scheme, nor a metallic holiday program, the colorful ribbons and fresh greenery echo and enhance the home's existing color-happy interiors and are perfect for the Christmas season!